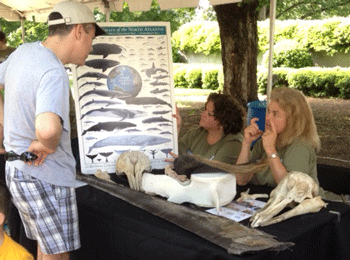 Education Outreach activities provide educational experiences for both youth and teachers via hands-on workshops and programs based at CMAST, or delivered on school campuses. CMAST serves as the coastal satellite campus of NC State University’s Science House, the education outreach arm of the College of Sciences. We maintain collaborative partnerships with educational institutions, school systems, and community partners through grants and professional development agreements that directly support area school districts by providing professional development opportunities and classroom support. In this way, we bring coastal connections to classrooms. K-12 activities at CMAST range from “Dolphin CSI” to understand why a particular dolphin may have been stranded on the beach, to beach seining to collect animals and understand how they survive, to seafood technology activities that allow students to “taste test” new seafood products, to participating in local and regional science contests. 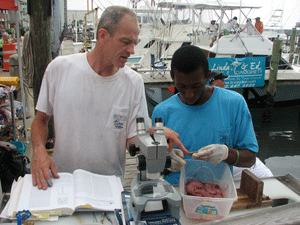 CMAST Ph.D. student Paul Rudershausen provides educational outreach to a young scientist. Education Outreach at CMAST also provides quality teacher professional development, scientific equipment loans, educational materials, programs and activities to support formal and informal education both in the classroom and outside. Programs at CMAST regularly blur the line between Education Outreach, Research and Extension activities. For example, research by the Seafood Technology Program is routinely communicated and applied in the seafood industry via extension activities by the former. The Animal Health program routinely provides clinical care for animals at the NC Aquarium System and Jean Beardsley Sea Turtle Hospital, and research in fisheries and marine ecology is applied by state and federal fishery managers.